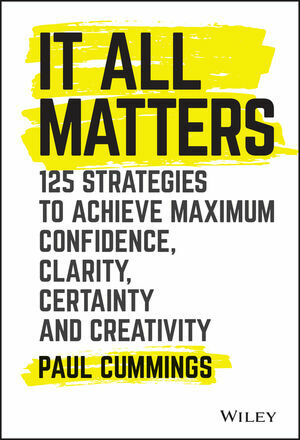 It All Matters presents a framework for the rest of your life. What are those dreams you would only dare to dream if there was no possibility of failure? How can you live a life of real intention and purpose instead of duty and obligation? This book answers these questions and more. Everyone has the capacity to author their own destiny; it's not our circumstances that shape our lives, it's our response to those circumstances that either propels us to great heights or keeps us stuck in the mud. Here, author Paul Cummings shares one of the most comprehensive goal setting systems ever put into print. Based on the key U.B.U. process—Understand who you are, Be true to yourself, and always be Unique—this framework gives you the power to transform your life. Through a fast-moving series of engaging stories, you'll learn how to question yourself to greatness as you begin to think in bigger and more positive terms. Professionals from across the globe have implemented this framework to achieve what they truly wanted out of life—isn't it your turn? This enlightening guide teaches you the revolutionary strategies that can help you make big things happen. PAUL CUMMINGS is the President and Chief Executive Officer of Paul D. Cummings World Wide Enterprises, a training and teaching company that has motivated and inspired hundreds of thousands of individuals and businesses to make real and lasting change. Paul also developed Woople, a web-based learning system, to deliver an award-winning online video program utilized by thousands of students.